Are you looking for voice over production services? Don’t waste your time sifting through hundreds of voice artists to find the voice artist you need for your project. At Trágora we have an ideal solution for you. You tell us what you need and we’ll offer you demos for the audio visual voice artists who best fit your needs and your budget. Once a voice artist is chosen, we’ll deliver you the voice over ready to use for your videos. Ask us about the language you need, we’re sure we can offer a solution that’s right for you. You can also listen to some online voice over demos from voice over artists in several languages on our website. Our roster of professional voice artists is made up of male and female voices of all registers: grave, deep voices, close, natural voices, young, dynamic voices, etc. Tell us what you need: at Trágora we can get it for you. 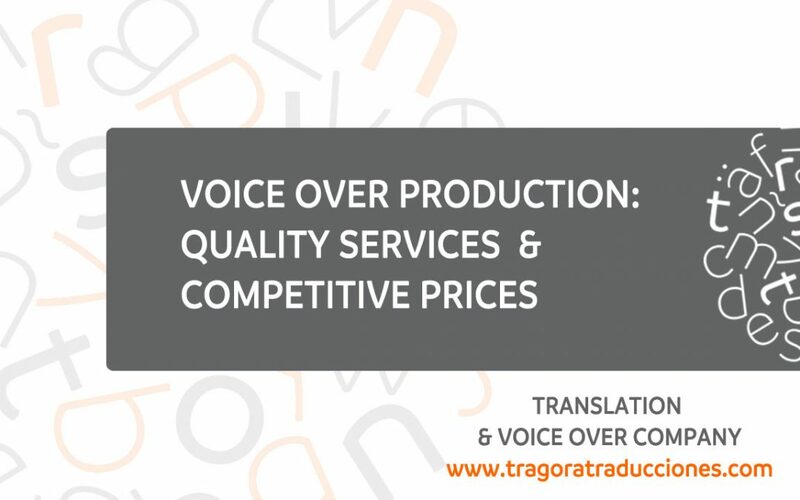 We do all the work for you, saving you time and money, because we want to make sure the cost of audio visual voice over production is always as tight as possible (of course, we’re not referring to cheap voice overs, but economical voice overs). Get a free VO quote now. Controller» Trágora SCA. Purpose» Reply to your query. Legal basis» Your consent. Recipients» We do not share data with third parties. Rights» Access, rectify, limit and delete your data.